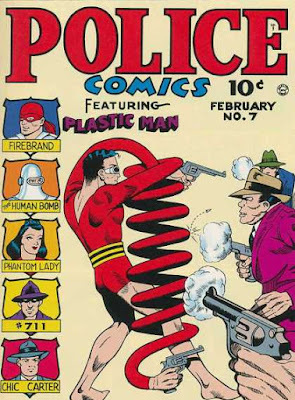 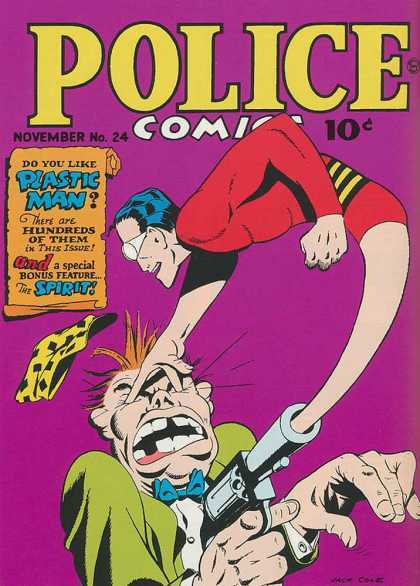 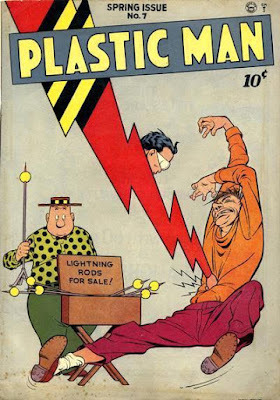 'Plastic Man', aka 'Patrick "Eel" O'Brian' debuted in Quality Comics' "Police Comics" #1 (1941), created by cartoonist Jack Cole as one of the first superheroes to incorporate humor into mainstream action storytelling. 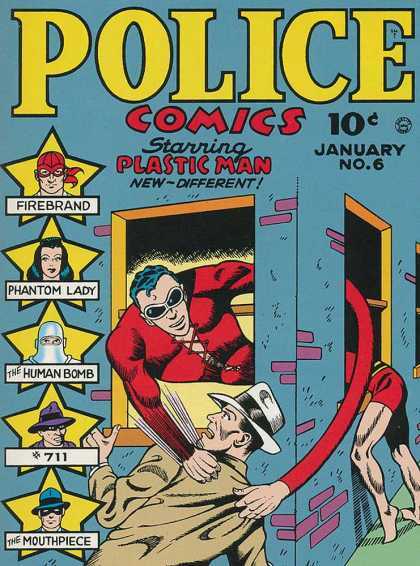 "'Patrick "Eel" O'Brian', became part of a burglary ring, specializing as a safecracker. 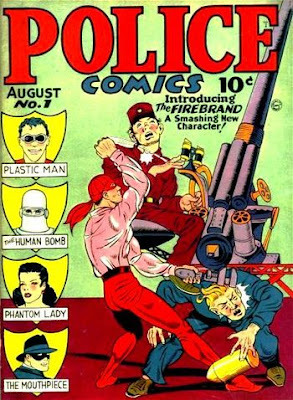 During a late-night heist at the 'Crawford Chemical Works', he and his three fellow gang members were surprised by a night watchman. "During the gang's escape, Eel was shot in the shoulder and doused with a large drum of unidentified chemical liquid. 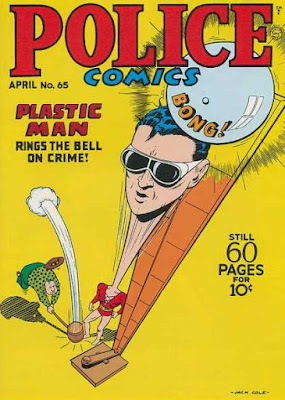 He escaped to the street only to discover that his gang had driven off without him. 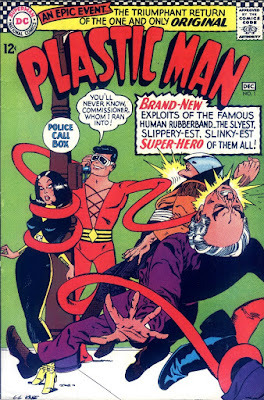 "Fleeing on foot and suffering increasing disorientation from the gunshot wound and exposure to the chemical, Eel passed out on the foothills of a mountain near the city. "He awoke to find himself in a bed in a mountain retreat, being tended to by a monk who had discovered him unconscious. 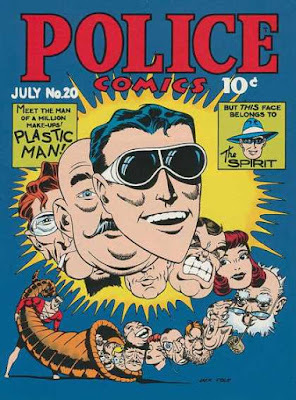 "The monk, sensing a capacity for great good in the man, turned away police officers who had trailed Eel to the monastery. 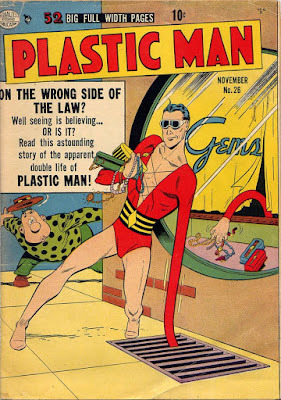 "This act of faith and kindness, combined with the realization his gang had left him to be captured, fanned Eel's longstanding dissatisfaction with his criminal life and his desire to reform. 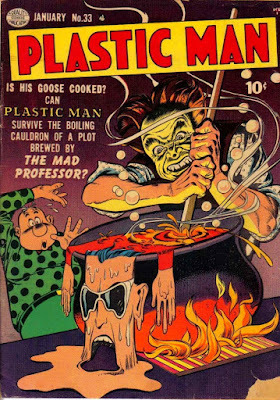 "During his short convalescence at the monastery, he discovered the chemical had entered into his bloodstream causing a radical physical change. 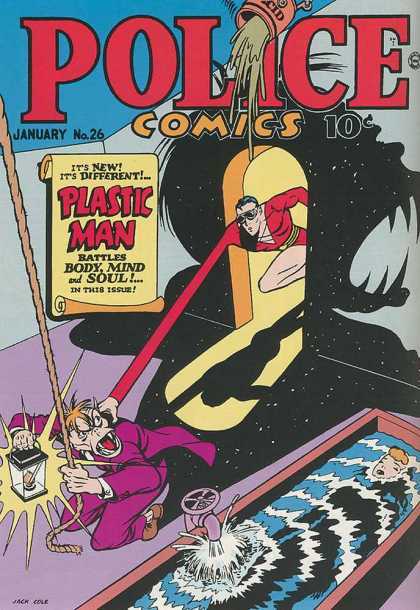 "His body now had the properties of rubber, allowing him to stretch, bounce and mold himself into any shape. 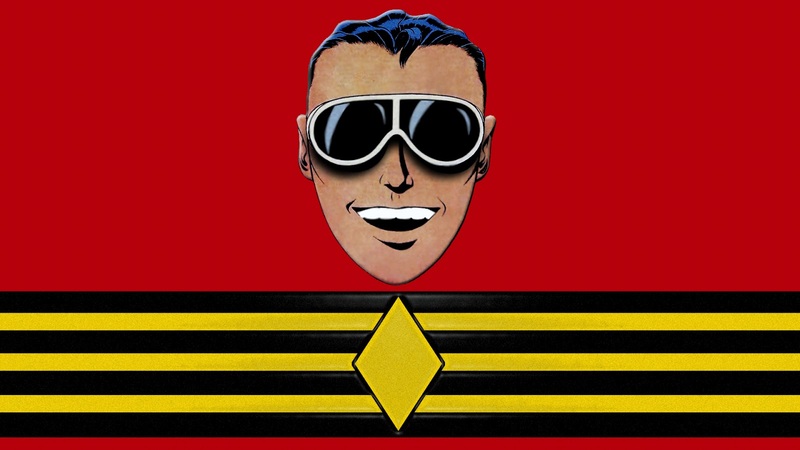 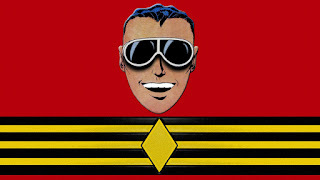 "He immediately determined to use his new abilities on the side of law and order, donning a red, black and yellow rubber costume while capturing criminals as 'Plastic Man'. "He concealed his true identity with a pair of white goggles and by re-molding his face. 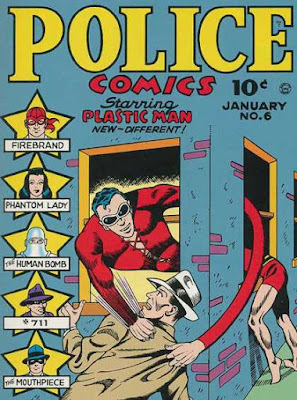 "As Eel O'Brian, he maintained his career and connections with the underworld as a means of gathering information on criminal activity. 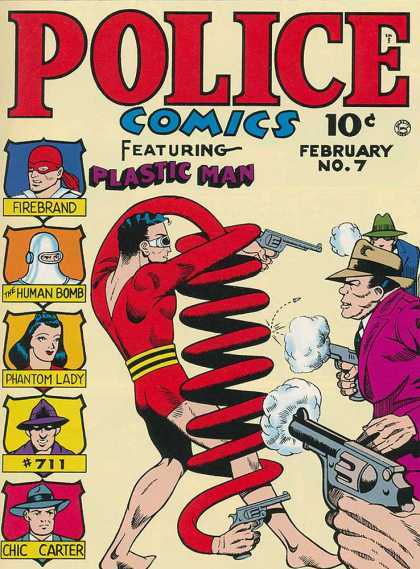 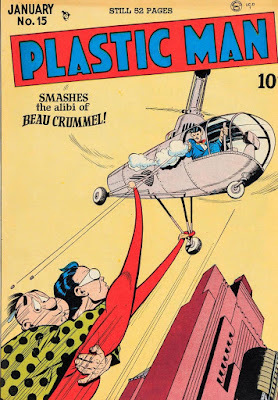 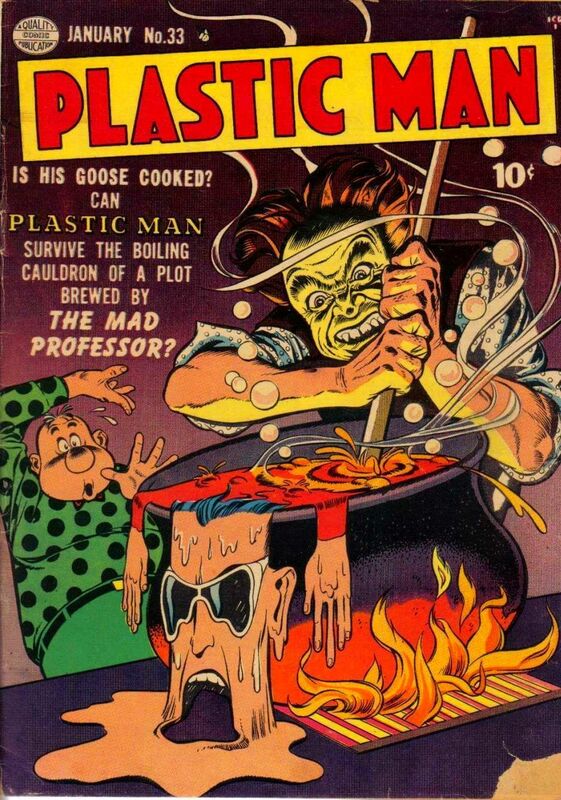 "Plastic Man eventually became a member of the city police force and then the 'FBI', finally abandoning his Eel O'Brian criminal life, with something far more subversive..."